Savvius Vigil is the first network forensics appliance dedicated to security investigations. Savvius Vigil automates the collection of network traffic needed for security investigations, both reducing the likelihood of a breach, minimising their impact. Even breaches not discovered for months can be effectively investigated using Vigil. 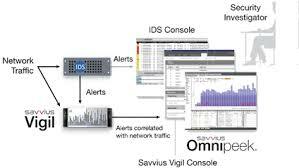 Savvius Vigil, which integrates with all leading IDS/IPS systems, includes Omnipeek, award-winning network forensics software. Savvius Vigil integrates with your existing SIEM/IDS/IPS capabilities to intelligently determine what network traffic is relevant for breach investigations. Vigil continuously collects all network packets and only stores traffic associated with security alerts, discarding unassociated packets. The device also supports feeds from multiple sources simultaneously. Vigil captures the critical packets that led up to the alert being triggered, from up to 5 minutes before the alert, showing the original cause of a potential breach. You can also configure Vigil to store all packets based on specified IPs, ports or protocols, all the time, to provide insight into attacks that IDS/IPS solutions miss. And if you suspect an attack is ongoing, you can initiate a full packet capture with a single click, including up to 5 minutes of packet history. Security Forensics capability, including hierarchical search by date, event, IP address, severity, etc.